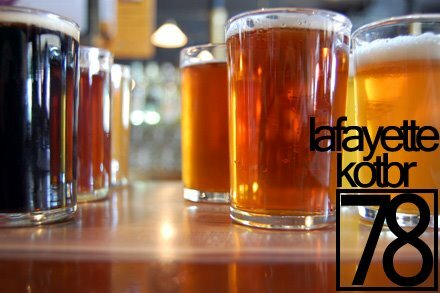 Hoosier Beer Geek: A Beer Blog for Indiana, from Indianapolis: KOTBR #78: Lafayette, we are here! On the way up to Purdue country, I confessed my desire to ask every bartender we met about their favorite combination for a boilermaker. I mean, Purdue is home to the Boilermakers. Certainly, even the craft beer joints have been asked to make a boilermaker for some annoyingly drunk alum at some point. What craft beer and what whiskey would go great together, I pondered. I was hoping for some wild suggestions. 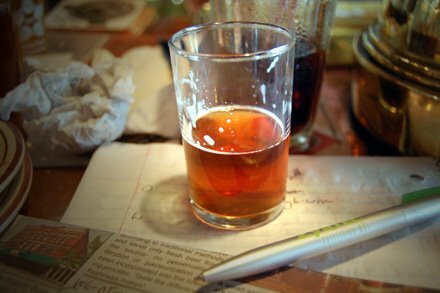 But of the two joints we hit, neither had been asked to make a boilermaker before. The Lafayette Brewing Company doesn't even serve whiskey at its main bar (they do on the second floor, which is set up for events, concerts, etc.). A bit disappointing? Yes. Did it stop us from marching on? Not at all. Our first stop: Lafayette Brewing Company (622 Main Street, Lafayette, IN, http://www.lafayettebrewingco.com/), where Greg and company have been producing craft beer since 1993. This is my third trip to LBC; this is the first for Mike and Gina. 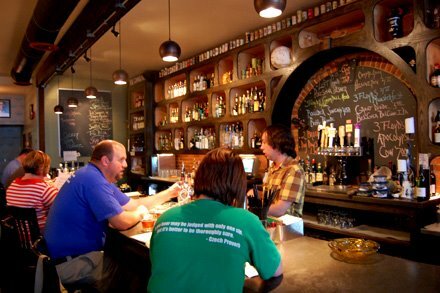 Gina commented, "I love Lafayette Brewing Company's cozy atmosphere." When we visited, the restaurant and bar were full of warm colors and wood finishes. The long bar faces an antique back bar complete with mirrors, perfect for people watching. While sitting at the bar, to your left you can watch the brewmasters perform their trade through a set of windows. You would certainly call this a pub. It has all the feel of an English establishment, but on a larger scale. Families are served from the dining room side of LBC and the entire venue is non-smoking. Before we talk about the beers (which is the reason we are here to begin with), I want to talk about the people. 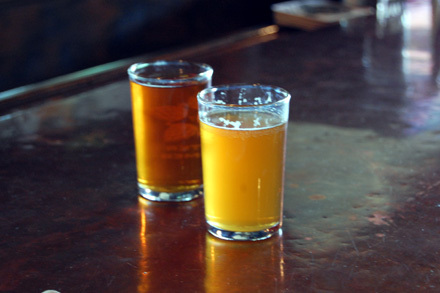 As we all know, a good bar or brewpub is more than a physical space and a collection of alcoholic beverages. It is also about people. People behind the bar, like Kelly, who was very friendly and knowledgeable. And people at the bar, like James. James is a well-known regular. He's Irish ex-pat who is a professor at Purdue. 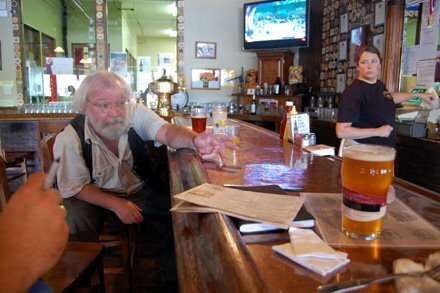 Mention the professor to bar staff or regulars, and they will know who you are talking about immediately. James likes his beers. And his engineering background leads him to do some things many of us don't do. For example, he carries with him a flexible thermometer. This particular thermometer is designed to wrap around glasses and give the temperature of the contents within. 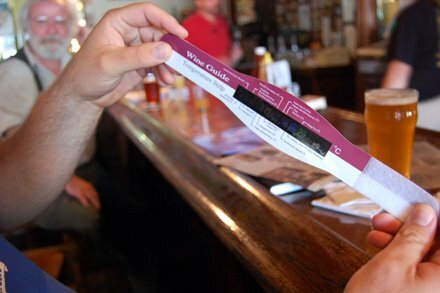 It is normally used by those who enjoy wine. But he likes to use it on his pints of beer. 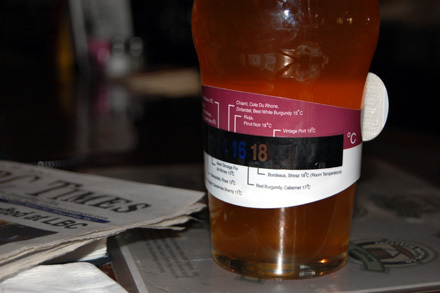 This particular beer (I believe it to be the "Eighty Five") comes up between 16 and 18 degrees Celsius. That's about 60 to 64 degrees Fahrenheit to you and me. Does that tell us a whole lot? Not necessarily. It's just interesting (and James likes his beer cooler than what you stereotypically expect from an Irishman). Along with the fascinating quirks, he also was a great resource for identifying beers to try (he recommends blending the Eighty-Five and the Prophet's Rock Pale Ale...unfortunately, the latter was not on tap during our visit) and places to visit (along with Lafayette's Black Sparrow, Knickerbocker, Chumley's, and West Lafayette's Scotty's Brewhouse, he suggested we check out Preston's, which reportedly always has Bell's Two Hearted on tap...unfortunately, we did not hit all of them; a list for a future visit!). So if you are at LBC, and you see the good professor (and you like to talk to people, like I do), be sure to strike up a conversation with James. Jason: After having publicly proclaimed that I did not like hoppy beers on a popular craft beer podcast almost three years ago, I've done a complete one-eighty. Or perhaps a one-eighty-five? All puns aside, I'm big on hops. And Eighty-Five doesn't disappoint. I liked this so much, I considered buying the LBC '85' hockey jersey. Anyway, the Cascade hops standout in the draft version. The grapefruit/citrus aroma stands out. We were lucky enough to be there when they brought out a firkin of Eighty-Five. It looked of orange juice, with a more concentrated citrus aroma to boot. There were more bitters, but there were also more sour flavors, which I'm not a big fan of (in three years, I suspect I'll be the biggest sour beer fan in the world). 4.15 Mugs - draft; 3.85 Mugs - firkin. Piper's Pride - The Piper's Pride Scottish Ale poured a woody amber color and had roasty malt elements that brought to mind smoke and oreo cookies. 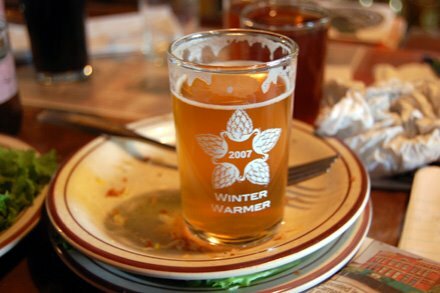 While that might not sound like an appetizing combination, the thinner mouthfeel meant that this was an extremely easy to drink and tasty brew. Piper's Pride - This beer made me think of smoke (like hickory, not cigarettes) and gingerbread cookies. The bitterness in this beer jumps up as it warms. This would be a great winter beer. Weeping Hog IPA - On draft, this seems like a light version of an IPA. The Eighty-Five is definitely hoppier. But the cask version is very tasty. Like most places, if there is a cask conditioned version available, get it! 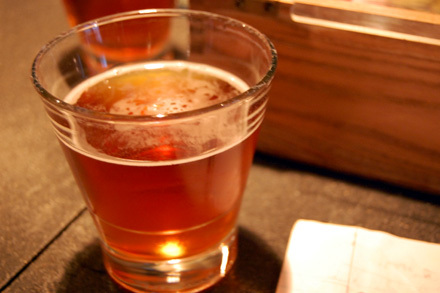 Dog Days - LBC's version of a summer lager, it was named for the public art display in Lafayette and West Lafayette. This has a fuller flavor and mouthfeel than you would expect from a lager. This is better than most that I have had and serves well, even at room temperature. Ouiatenon Wit Bier - A very nice and wheaty beer that could stand up to the hottest of summer days. We had a discussion about the name of this beer, and I asked if it had anything to do with yes and no, but wikipedia says no...the name "Ouiatenon" is a French rendering of the name in the Wea language, waayaahtanonki, meaning "place of the whirlpool". Black Angus Oatmeal Stout - A smoky English-style stout beer with plenty of oatmeal and chocolate hints. Weeping Hog IPA - This reminded me of a peach soaked in vodka in the best possible way. Really nice! We also tried this on cask and I believe Greg said the IPA's were made with different malts. After LBC, we moved down the street to the Black Sparrow Pub (223 Main Street, Lafayette, IN, http://www.blacksparrowpub.com/). Bar manager John has been regularly submitting tap updates to our Random Beer Roundup, and we've been nothing but impressed. 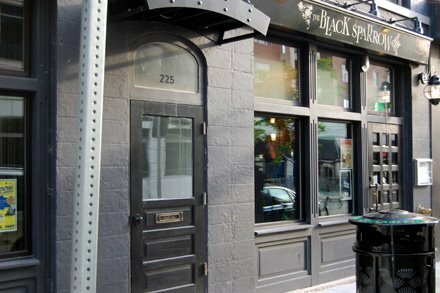 The Black Sparrow opened in 2007 and has become a favorite of beer geeks, foodies, and fans of classic cocktails. John and his bartender Brad (don't call them "mixologists"...they're bartenders) will shake up a number of quality classic cocktails. When I say classic, I mean they searched out recipes from before Prohibition. Drinks like the Aviation, the Bourbon Flip, the New York Sour, the Sparrow Sidecar, and the Tequila Swizzle. 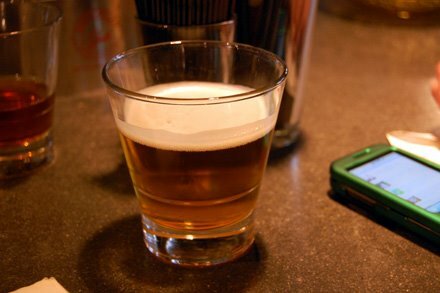 Even if you aren't ordering up one of these drinks, sit at the bar and watch them work. It is an art in itself. The tap menu is constantly changing, as the chalkboard shows. And there is a large selection of bottled beers as well. There is some overlap between the clientele between LBC and the Black Sparrow (in fact, we bumped into John earlier at the LBC bar), but as the night goes on, the crowd changes a bit from the downtown worker and dweller crowd (like Diane, Esq.) to a younger, hipper cocktail crowd. The bar also allows smoking after 10pm. Mike: How glad I was to see this on tap. The only problem I have with Three Floyds beers is that taking a chance on a $10+ bomber of them can be risky. Even if I'm paying $7 for a pint (and I have no idea what we paid for this one, but I'm guessing it wasn't cheap), that seems much more reasonable. Labels: Black Sparrow Pub, Lafayette Brewing Co. I think it is awesome that you guys did something on LBC. I think they get overlooked around these parts and I think they make some great beers. I usually will make there a couple times a year after my Boilermakers squander another football victory. Eighty-five, Black Angus and their Barley Wine is definitely my favorites. Chris, we are well aware of your opinion on engineers and other mathmatical geeks. Now back to the lab with you! Anon, one of the biggest challenges for us at HBG is getting out of our geographic area to promote more about Indiana beer. Unfortunately, we all have M-F 9-5 jobs that keep us from travelling much. There are great beers all around the state. Lafayette, Ft. Wayne, Kokomo, Mishawaka, the Region, New Albany, Evansville, Aurora, Columbus, Bloomington. I wish, I so wish we could get to all of those places more often. CorrND - I think one of those thermometers came with our first aid kit, except in degrees Fahrenheit.